Finally, we reach the end of reviews of my CD finds from half-price day at the Friends of the Multnomah County Library Annual Booksale. I am fond of Indian classical music as what you might call chillout music -- I like to play it when I'm writing or paying the bills or doing anything else where I don't want to concentrate, but could use a little groove going on. 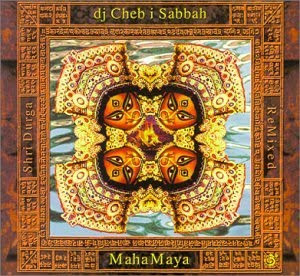 What dj Cheh i Sabbah does here is just what you'd expect -- takes Indian classical performances, manipulates them electronically, and puts some beats underneath them. He treads lightly, though, so this isn't club music that you would dance all night too at your local South Asian rave. Indeed, it's a light enough touch that, for several listens, my feeling was more along the lines of "why listen to this when I could just listen to straight Indian classical music?" Prognosis: It's fine but fairly unremarkable. Good background music for your South Asian imports shop. But I took the disc to work to listen to for this review, and it's kind of grown on me, so I think it will stay with the little work CD collection for the time being. And not a lame project at all--I enjoyed these. Thanks, guys. I'm glad you didn't think they were lame, Ben. But with this project, I might have found the spot where something is too arbitrary even for me!